These Trinity Pink Dangle Earrings are hand made in Indonesia. 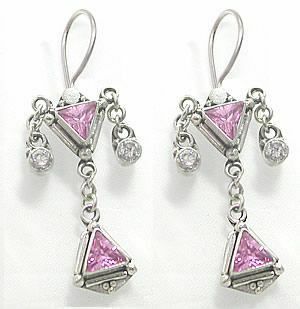 These magnificent earrings have two triangular pink jewels connected by a sterling silver dangle, as well as two crystal jewels dangling from the top jewel. These unique earrings are sure to add flair to any outfit. Check out this matching Pink Jewel Belly Button Ring.